HOLLAND, Michigan (June 15, 2017) – National Bulk Equipment, Inc. (NBE). This automated bulk material handling system provides a total process solution for moving highly fragile product through multiple process operations into bulk storage for temporary holding prior to final packaging. At a process rate of 12,000 pounds per hour, bulk totes of the product are nested into a lift carriage; the tote is sealed to a custom-designed discharge hood. The tote is vertically conveyed, using 1-1/2 inch, solid 304 stainless steel track and cam rollers, to a 23-foot discharge height. During tilting of the tote, optical sensors ensure a maximum product discharge drop distance of no more than 5 inches throughout the entire 150º rotation. 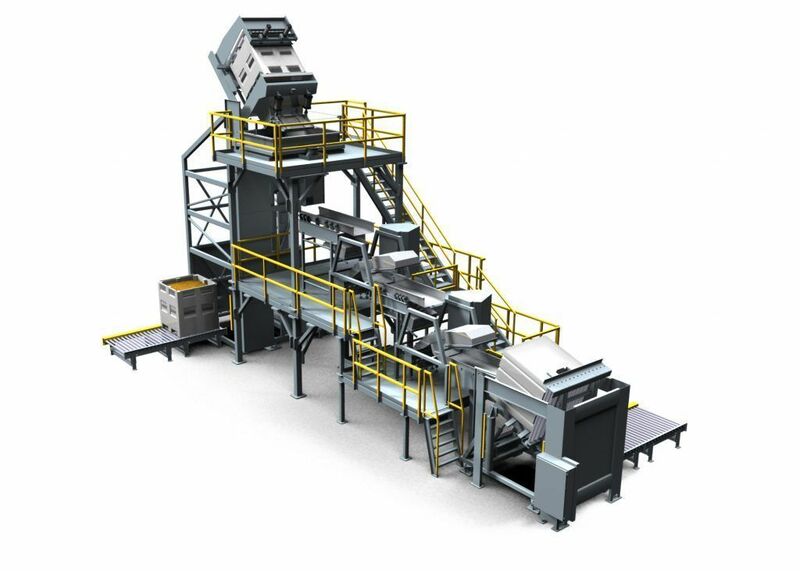 Additional material handling occurs as three stages of vibratory conveyor move the highly fragile product through two stages of high-speed image processing and sorting to ensure the material maintains its original characteristics throughout processing. The finish-processed product is then moved into a storage tote using a reverse-tilt fill method to, again, ensure the fragile product drop does not exceed 5 inches during filling. The final take-away conveyor section includes an integrated, NTEP-certified weigh system to ensure the filled tote weight is accurate to +/- .01% of the tote’s 4,000-pound total capacity. Conveyor and container routing is directed from a single, menu-driven HMI designed and built by NBE. NBE automation expertise integrated the system-wide control, communication, monitoring, and data reporting to the facility’s central control system architecture. NBE integrated automation and performance-proven construction increased material processing rates while reducing material reject rates.